Some days it just doesn’t make sense to trek to the hack space in order to work on project. Bad weather is a problem since I live more than a couple minutes away. Yesterday was my 13 month anniversary of dating my girlfriend and it fell on February 29th so we had an evening together. I was too tired to head over to the hack space. I suppose I could have installed some 3/8” bolts I bought for the recumbent bike but trying to write a journal that could be summed up as “I installed two bolts” would be bad form. Instead I’ll start telling you about another project I’ve started in the background and one I can do at my apartment even if the weather is bad. 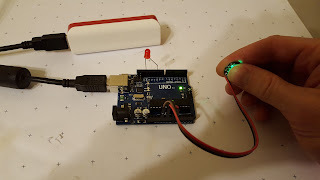 This project is a sensor intended to be used by cyborgs, specifically those with finger magnets like the one in my left ring finger or my left index finger. Another friend has a magnet positioned over his wrist. The premise is that that a controller activates an electromagnet which stimulates the implanted magnet. This is meant to give a more intuitive sense. Cyborgs on biohack.me crave this type of feedback since it emulates the Bottlenose project created by Grindhouse Wetwarez. My personal opinion is that this feedback is no more intuitive or useful than a vibrating more but certainly trickier to create. But, I’m not making this for myself so I am going to look forward to creating a better electromagnet than I’ve used in the past. The goal is to create a heart rate sensor that can be used to take a person’s pulse from any exposed skin so emergency responders can quickly take a pulse without searching a person’s anatomy. I personally have trouble finding another person’s pulse so it is appealing to make since I can increase my own ability to sense pulses without training. Components were assembled to build the basic circuit an amplified pulse sensor. An earlier undocumented attempt tried to use an unamplified version but failed. The amplified version was four times more expensive and the unamplified version is now difficult to find because they were not reliable. The leads on the heart sensor were not labeled well but only one configuration lit up the green light on the sensor. Stock code described the input pin on analog pin 1 but the code itself required the sensor's output pin to be on analog pin 0. Once this discrepancy was accounted for the code performed well. 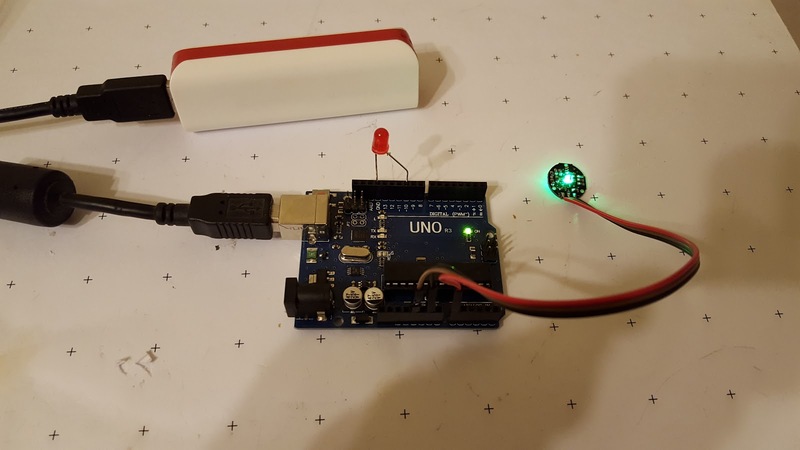 Serial output showed pulses through the computer's serial monitor, the onboard LED blinked at the same time and an LED on one of the Arduino's PWM pins came on then faded out with heartbeats. The device performed the same when powered by a USB battery and not connected to the computer.